During the past month I have refurbished a number of DBA ancient armies among them two Later Imperial Roman collections. These were painted many, many years ago and some of their number have since been cannibalized to build up other armies which were later sold. The motivation to begin refurbishing the Late Romans was due to the extensive collection of Sassanid Armies; these span all three sub-lists. 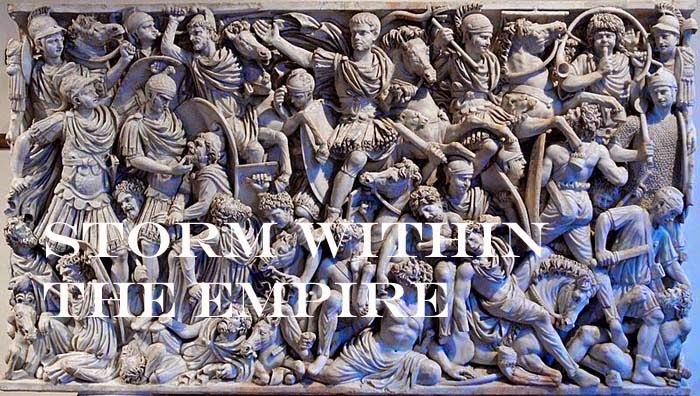 Not only are the Middle Imperial Roman army enemies, but the Roman connection extends to the Later Imperial (II/78b) and Patrician Roman (II/82b) period. To restore the Later Romans new cavalry figures were ordered to replace the Clibinarii and heavy cavalry elements. All figures were given Palatine status which meant purple decoration for auxilia, cavalry and artillery figures. Figures for the Legions were covered in mail and that saved a bit of painting. All in all I was very pleased with the results. and the remaining figures will be repainted or touched up as needed. Milliput and brass wire were used to build draco standards for Clibinarii and Legionary units. A brief tutorial can be read at the Fanaticus Forum. 1 x General (Cv), 2 x Clibinarii (4Kn), 1 x Equites Illyriciani (LH), 1 x Horse Archer (LH), 3 x Legionaries (Bd), 2 x Auxilia Palatina (4Ax), 1 x Archers (4Bw or Ps), 1 x Equites (Cv) or bolt thrower (Art). The Command element with its collection of staff on foot with a mounted officer remained unchanged, nonetheless the banner and figures were given a renewed coat and extra details were added. The Illyriciani and Horse Archer elements will have brighter colour added, namely to the horse harness and clothing were improved. The three Legionaries are actually Sarmatian heavy infantry figures which have chainmail armour, a helm without crest and an oval shield, These are Old Glory 15s which have a nice eastern look which is a good alternative to their standard Roman figure. Shield design remains the same pattern but will have a new coat of paint. The two Auxilia are fine, but like the other elements these will have details added and shield patterns will have a new coat of paint. Both Archer types will need some touch up and details added, such as the appliqué pieces added to their shoulders. The Artillery are standard Old Glory. New paint for bolt thrower and artillerymen should do the trick. A third ballista will be fitted with a carriage for use with the later Bosporan Army which mimic Later Roman uniform styles. New to the collection are the Clibinarii and Equites. No shields are necessary for the 4Kn, but the heavy cavalry must have a design. Readers may be aware that the Eastern cavalry shield patterns are not illustrated in the Notitia Dignitatum, but my take on this is to duplicate the shield of a similar armed cavalry units of the Western series and use a different colour for the ground and concentric rings. I had been asked at TMP (The Miniatures Page) if I could post a photo of the figures before their transition. The only one available made me ill, but for those who are curious, here it is. Most of the cavalry units had been stripped to help build up other armies so what you see are the bare bones. I like this army - lovely brush work and background notes - well done Robert! I have enjoyed restoring these two commands and their test games against a variety of historical opponents has been exceptional. The mix of Kn, Cv, LH, Bd, Ax with Bw or Art is a very hard combination to beat.